The past year has been tremendously exciting for Redbooth, from announcing Series B funding to welcoming new customers to launching popular new features. Before the new year is too far along, I wanted to take a moment to share with you what we’ve done in 2014 and a look ahead at what we have in store for 2015. One of our most notable milestones of 2014 was undoubtedly raising $11 million in venture funding. Altpoint Ventures and Avalon Ventures, the two venture firms who led the funding, share our vision for the future of online collaboration and improved productivity, and we couldn’t be more pleased to have them with us as we forge ahead. We’re already in the process of expanding our organization to drive innovation and bring the best possible solutions and support to our customers. We also announced a licensing agreement with CA Technologies. It’s great validation that an award-winning billion-dollar company has selected our technology to enhance their portfolio. 2014 was also a year for recognition. In their Magic Quadrant for Social Software in the Workplace, Gartner described Redbooth’s broad capabilities and pointed out that our “extensive support for task management and reporting” made Redbooth “particularly suitable for structured collaboration.” In an Impact Report, 451 Research stated that Redbooth provided “a highly usable alternative to traditional unified communications tools.” We were honored to be the recipients of two Stevie awards at the International Business Awards: gold and silver for best new cloud platform and best new collaboration software. But the greatest validation for what we offer was seen in large-scale deployments with global brands, including eBay, Sirus XM Radio, Novartis, Cisco, Dell, GE, the BBC, the Red Cross, Thompson Reuters, Western Digital, Warner Brothers, and more. Providing them a solution to increase productivity and collaboration is immensely rewarding. The collaboration, project management, and task management spaces are crowded. We take pride in offering an elegant integrated platform that rises above the noise by uniquely combining collaboration and real-time communication in a single solution. And in 2014, we continued to strengthen our platform with well-received new capabilities. When we first meet our customers, they’re often drowning in email, struggling with unwieldy deployments of Sharepoint, or juggling a dizzying array of products that aren’t connected. We provide a better way — a single place to work where teams and organizations can come together and create workspaces where they can truly work together on an integrated, powerful, and easy-to-use platform. 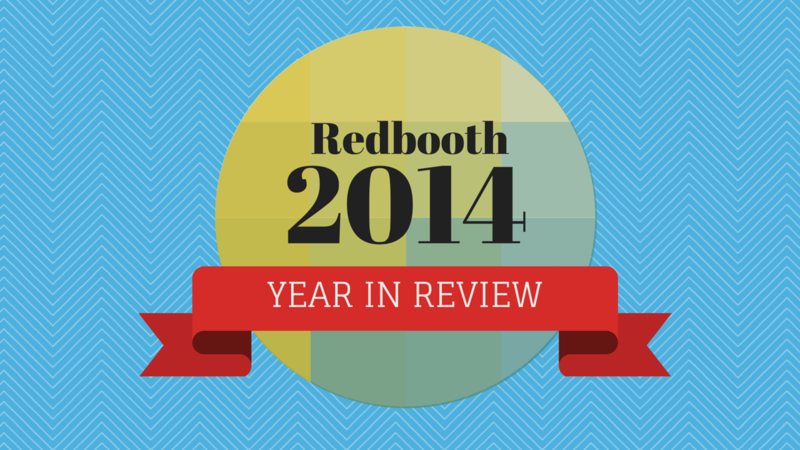 By adding chat, presence, and video over the last year, we’ve seen extraordinary impact in how people use Redbooth. Usage of the iPhone and Android apps has skyrocketed over 100%. When we rolled out chat, we saw a dramatic 6X increase in use of the platform. We’re making it easier for people to stay connected to Redbooth — and to each other. We’ve had hundreds of customers reach out to us offering to take part in case studies and tell their story. It’s not unusual for us to hear that they’re seeing 50-70% increases in productivity or cutting in half the time it takes to do things. We’re proud to be providing our customers with a true competitive advantage — giving them an edge, saving costs, making it possible for them to get things done faster and better. In fact, we’re constantly inspired by stories of how organizations are putting Redbooth to work. Virginia Herring, the president of 1st Franklin Financial, a large financial institution in the Eastern United States, brought Redbooth in and initially rolled it out to her executive team. It had such a profound impact that she rolled it out to all employees — but she didn’t stop there. She actually gifted personal licenses to over a thousand employees so they could use Redbooth to organize their personal lives as well as their professional lives. She saw that more organized employees were also more focused and productive employees. Now that is a visionary. In addition to a secure solution in the cloud, we offer a product, Redbooth On-Premise, that you can install behind your own firewall quickly and easily. It meets many regulatory and compliance mandates, such as HIPAA, PCI, and other rigid data security and privacy requirements. As a result, we’re getting a great deal of traction and rave reviews from financial services, healthcare companies, and other highly regulated industries. In 2015, we’re excited to add new features and capabilities specifically for these industries. As Redbooth’s CEO, I’m proud to see the traction we’re getting — and proud that we’re able to provide our customers with a strategic advantage. We couldn’t do it without our fast-growing, capable, and extremely dedicated global team (we’re hiring!). We’re uniquely bringing together all the things that teams and organizations need to stay in touch, get aligned, be accountable, and get more work done in less time. It means so much to us that our customers are saying yes to that vision as well. We thank all of you for your support in 2014, and look forward to making 2015 a wonderful year.